The hotel is adjacent to the Twinbrook Metro Station (Red Line) making it an easy train ride to the famous attractions and important offices of the nation's capital. The Doubletree Hotel is offering a discounted rate of $89. This is available until May 24th. Call 301-468-1100 to make your reservation. Be sure to use the block code 'TeraTech' to receive the group rate. You will be required to provide a form of guarantee when calling. There is free parking at the metro on the weekends. Underground parking is available at the hotel. Self parking there is $7 per day. Take Route 195 West to Exit 4/I-95 South, then head West on 495 towards Silver Spring, and take Exit 34/Route 355 North (Wisconsin Avenue/Rockville Pike. Proceed approximately 3 to 4 miles on Rockville Pike and the DoubleTree Hotel will be on your right after the Rollins Avenue/Twinbrook Parkway Intersection. Take (110 North) George Washington Parkway to 495 North. When you are on 495 North, bear to the left to get to I-270 North towards Frederick and get off at Exit 4A (Montrose Road East). Proceed approximately 2 to 3 miles and make a left onto Rockville Pike (Route 355 North). Proceed on Rockville Pike through 4 stoplights and the DoubleTree Hotel will be on your right. Take 267 (Washington Dulles Access and Toll Road) East to I-495 North heading towards Rockville, and take I-270 North towards Frederick. Get off at Exit 4A Montrose Road East, proceed approximately 2-3 miles and make a left onto Rockville Pike (Route 355 North). 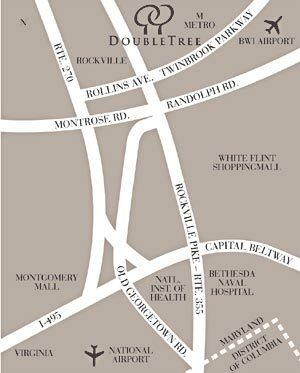 Proceed on Rockville Pike through 4 stoplights and the DoubleTree Hotel will be on your right. Take I-95 South to 495 West Towards Silver Spring, then take Exit 34 Route 355 North (Wisconsin Avenue/Rockville Pike). Proceed approximately 3-4 miles on Rockville Pike and the DoubleTree Hotel will be on your right after the Rollins Avenue/Twinbrook Parkway intersection. Take I-95 North to 495 North/East heading to Rockville/Tysons Corner, then take I-270 North towards Frederick and get off on Exit 4A Montrose Road East. Proceed approximately 2-3 miles and make a left onto Rockville Pike (Route 355 North). Proceed on Rockville Pike through 4 stoplights and the DoubleTree Hotel will be on your right after the Rollins Avenue/Twinbrook Parkway intersection.